Despite decades of opposition from the right, and recent personal setbacks, Gloria Steinem remains one of the most outspoken and visible symbols of the women’s movement today. 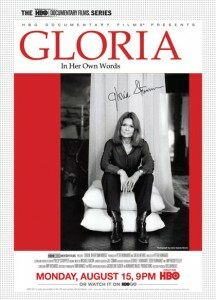 Produced and directed by Emmy®-winning documentary filmmaker Peter Kunhardt (HBO’s “JFK: In His Own Words” and “Teddy: In His Own Words”), GLORIA: IN HER OWN WORDS blends interviews of Steinem in her Manhattan apartment, archival footage, photographs from throughout her life and clips from press interviews over the years. Among those interviewing Steinem in the film are Barbara Walters, Helen Gurley Brown, Phil Donahue and Larry King. The documentary also features archival footage of such prominent women’s movement figures as National Organization for Women (NOW) co-founder Betty Friedan, congresswoman Bella Abzug and civil rights advocate Flo Kennedy. Click Here to visit the HBO website.